The first time I made an attempt on Carrascoy was back in April 2017 whilst staying at Bolnuevo with Gina on one of our extended early spring breaks in the campervan. Peakbagging was not really on the agenda but having noticed a likely candidate on the list of Spanish P600's, that even thenwas increasingly aquiring an interest, I persuaded Gina to join me on the basis it was a straight forward route without any excursions in to open country or away from paths and tracks. 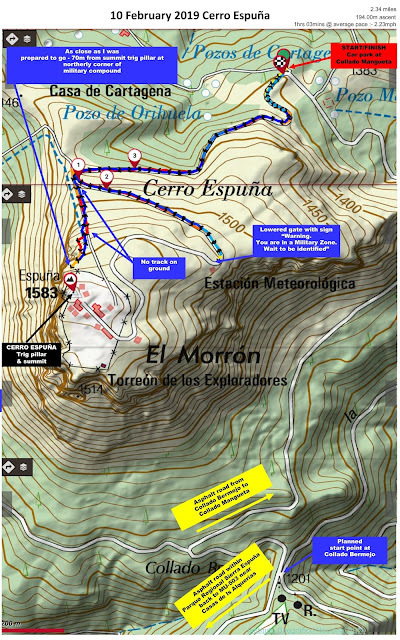 So after careful scrutiny of the map I had spotted a route from the north up what was possibly the access track to the radio tower and summit past Casa Juan Jordana (37.86554°N, 1.30590°W). Finding a parking spot on the RM-603 was the problem being what looked like the equivalent of a Spanish clearway with no suitable pull offs near any of th tracks all of which appeared to be active entrances to orange groves. Locked gate to Casa Juan Jordana. 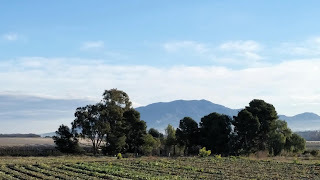 I did try to drive up the access road to Casa Juan Jordana but Gina was not happy as it had the feel of being private and in any event it really was not suitable for a 2 wheel drive vehicle beyond the farm property. For this second attempt I still wanted to check out other options from the north, but thanks to Evstratiy Potashnik on peakbagger for pointing out recent access problems from the north and recommending route from the south. 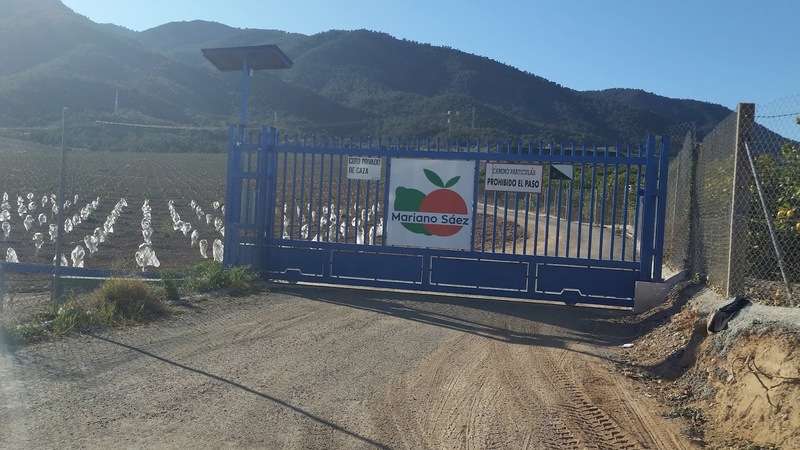 Not only is main access track at 37.87114°N, 1.31347°W gated, I drove the length of RM-603 from Casa Nuevas de la Costera to Casa de los Sordos entrance and all minor tracks are gated linked by high fencing protecting orange groves. Seems Gina was obviously right (again) two years ago. 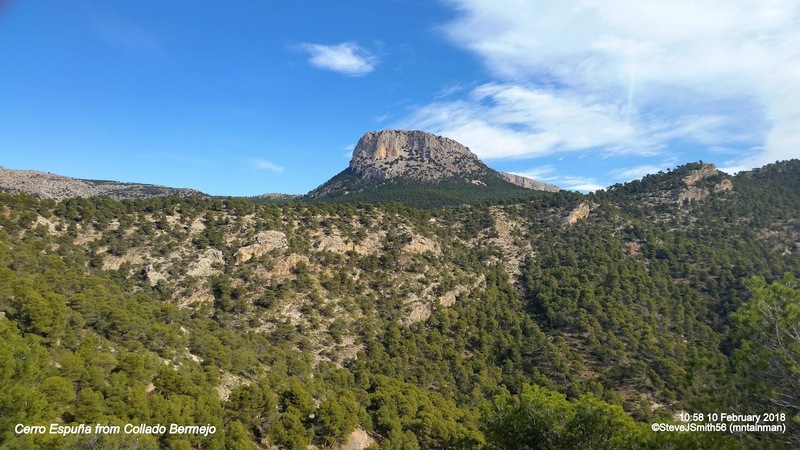 So a 30km drive round the mountain to La Murta. I managed to drive up rough track and parked at 37.83238°N, 1.25314°W. Track continues for a while longer until becomes an easy to follow path all the way to summit ridge where there is an ashfalt road linking all three spot heights each surplanted with radio towers. I visited 1064m HP and the trig pillar at 1062m. Did not bother with 1061m returning down ascent path and back to van. Can not help feeling disappointed after today's effort even though I knew from the outset I would not be able to reach the summit and trig pillar within the military compound on top of Cerro Espuña. Getting to within 70m on the day only seemed to increase the disappointment. 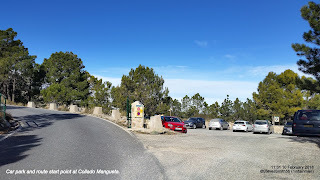 Plan was to park at Collado Bermejo if the access road from the MU-503 near Casas de ls Alquerías was suitable. 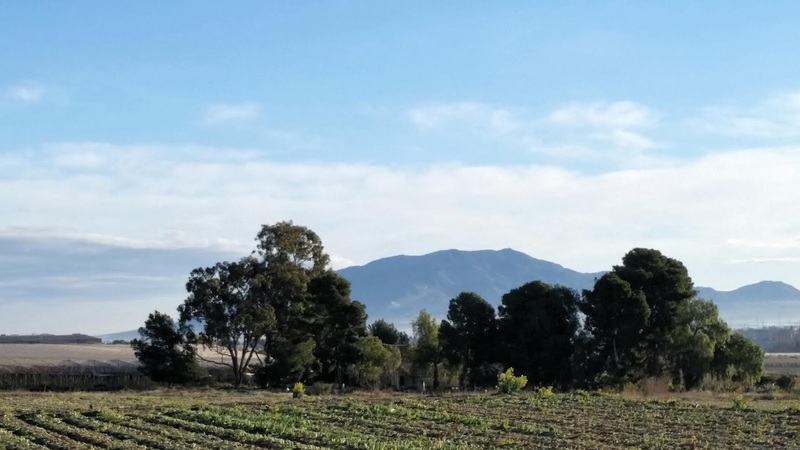 Turns out it is the Camino a Morianoa,an asphalt road servicing a number of car parks giving start points to an extensive trail network around the Parque Regional Sierra Espuña. 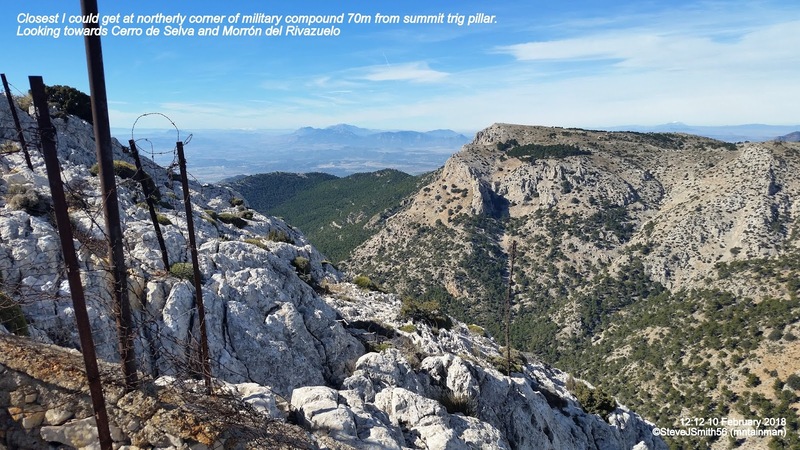 This would leave a 7 km hike up the military compound access road and hopefully the chance to get as close to the high point without being arrested or 'shot'. Even better the good fortune continued past an open barrier giving closer access towards the summit as far as a public car park at Collado Mangueta which is as far as you can legitimately go in the car. Car park and route start point at Collado Mangueta. 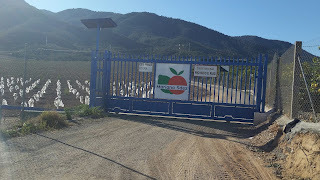 Access beyond this point is still possible, however a sign in only Spanish states "Restricted Access, only authorised personnel". 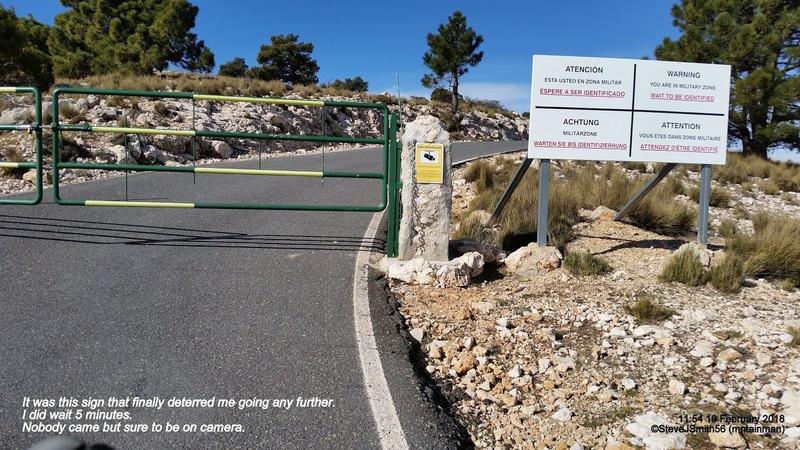 People hiking up the road and cyclists passing persuaded me it was OK to walk and only applied to vehicular access and on the way up I met a couple coming down who confirmed you could get to the military compound boundary fence but not the summit. About 750m from the car park, there is a 2nd sign in Spanish, German and English "Do not go beyond this point". In a vehicle? Followed by a 3rd sign "Military Zone. No Trespassing". It was this sign that finally deterred me going any further. Finally on rounding a bend to the right there is what looks like sentry box, but is in fact Un Estación Meteorológica, near a closed gated barrier across the road at 37.86418°N, 1.57033°W. This time a sign in four languages with French now being added, stated "Warning. You are in a Military Zone. Wait to be identified". I waited about five minutes to be identified with one last hope I might be able to explain my purpose, but no one turned up, so with a heavy heart I decided discretion was the sensible option I turned round with my head down full of disappointment resigned to claiming a log as an "Attempt". However on the way down I remember another track shown on the map starting at 37.86664°N, 1.57549°W and since this was before the "No Trespassng" sign decided to investigate this route. 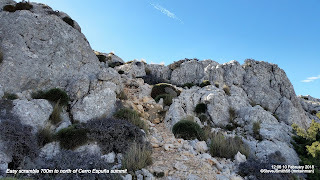 There is no track on the ground other than a faint path that takes you to the bottom of a small cliff that is easily scrambled bringing you to within about 700m of the summit trig pillar. 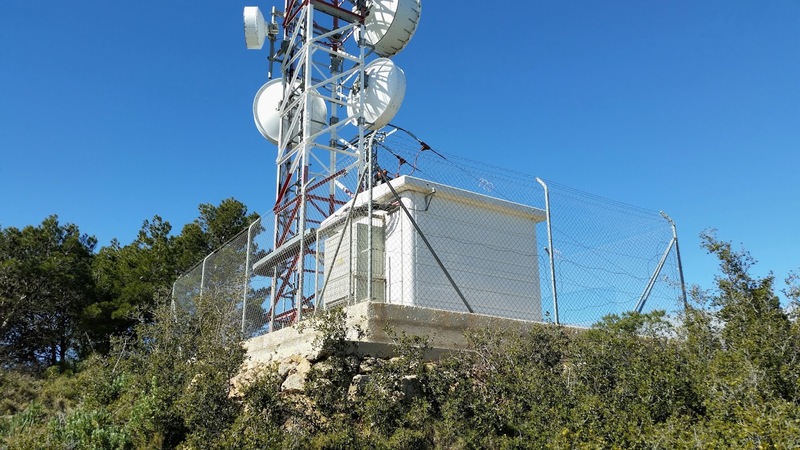 You can get as far as about 70m from the trig pillar at the North fence corner of the military compound, deciding not to go further along the boundary due to the strongly implied intention of restricted access by a collapsed rusty fence bisecting the fence corner. So finally relented on the basis it is military property in a foreign land and even though the fence was collapsed and rusty the intent was still clear. Closest I could get at northerly corner of military compound 70m from summit trig pillar. 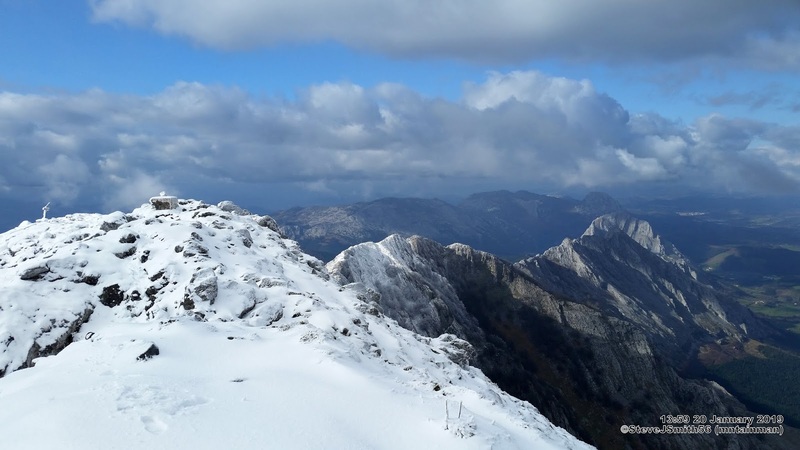 Amazing day yesterday ascending Anboto; 1331m, P734, from Gantzaga. Testing and extending winter skills to the full. Not to mention decision making processes regarding safe to continue. 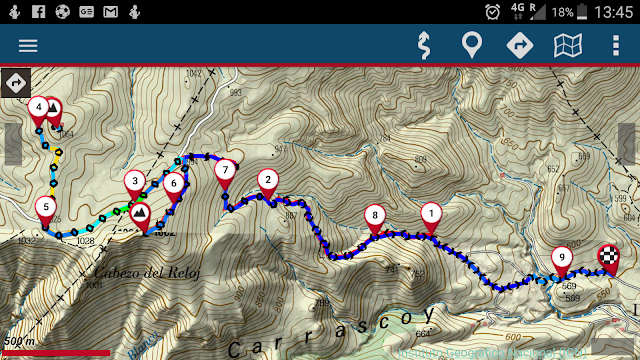 Very close to turning round with less than 100m to the summit. Think I got it right. 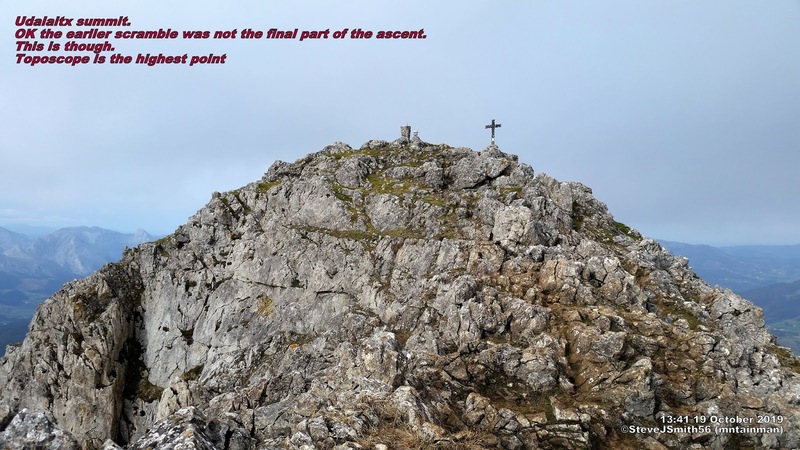 Just a few captioned photos of time on summit providing journal and description of key parts of ascent, descent and summit photographs. More photos, Route map, Statistics and other route info to follow. Full set of captioned photos providing journal and description of key parts of ascent, descent and summit photographs. Unfortunately cold got to camera battery on summit so no photos of route along ridge returning off summit. Met a local on way up who told me about a cave and water source that could be useful during a summer ascent. Just too breezy and cold today. Route map, statistics and other route info to follow.